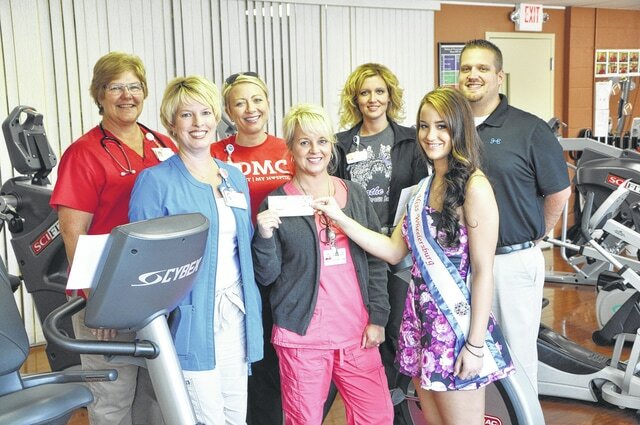 Miss Wheelersburg Julianna Logan, a contestant in the 2015 River Days Queen’s Pageant, recently donated $1225 to the SOMC Heart and Vascular Fund. The fund supports patients who have experienced heart attacks or other heart health issues. Logan, who was diagnosed with a heart murmur as a child, has dedicated her River Days candidacy to the issue of heart health. Logan raised the donated funds by holding a “Run For Your Life! Zombie 5K,” which drew more than 120 participants – many of whom were dressed in full zombie attire and with full makeup.